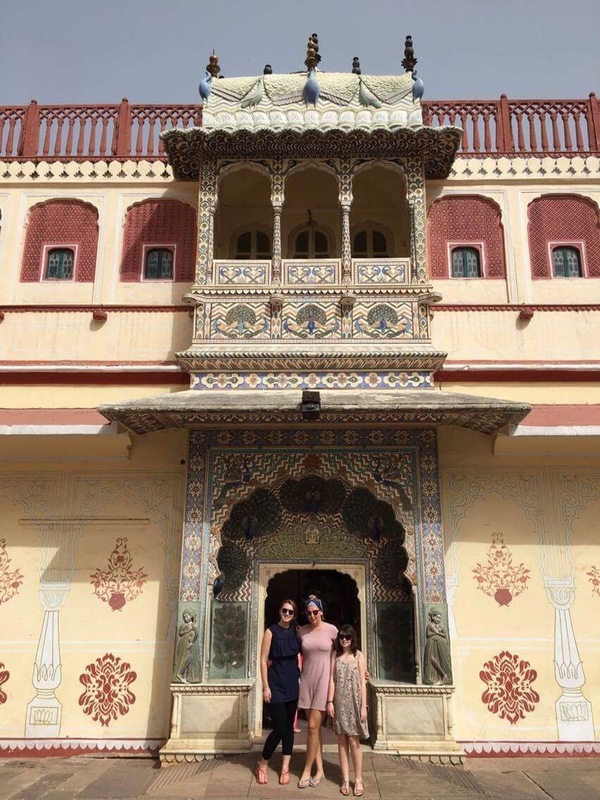 We left dusty Ranthambhore for the pink city, Jaipur. Here it is the Maharajas of the Rajput clan, not the Mughuls, that have ruled since the 9th century. 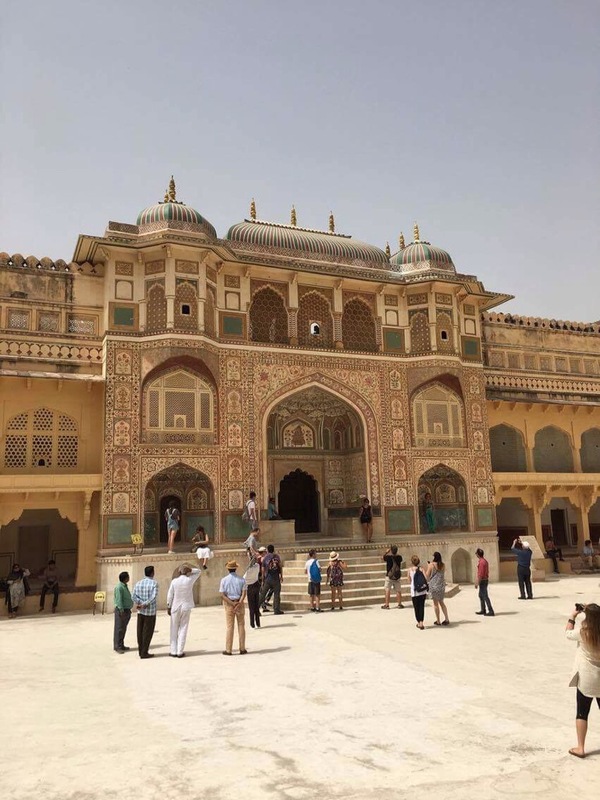 The capital of Rajasthan is only young, moved in 1727 by the Maharaja Jai Singh to accommodate the expanding population of Amber and was designed for 190,000 people. Driving into the city you emerge through one of the many old gates in the encircling city wall, all the markets and buildings painted in a terracotta colour they refer to as pink signifying prosperity. This was painted in 1876 to welcome Prince Albert and has been kept that way ever since to recognise the cities royal heritage. Our bubbly guide also gave us a good opportunity to learn more about local Indian culture. He had three daughters, only one was biologically his and two were his brothers, but as his parents and his brothers family all lived together as three generations, they were all his. The grandparents were about to set about choosing a match for the eldest, 18 years, someone from their caste (class) but from a different subcaste (surname). Someone good looking with good prospects, and the younger daughters could not marry out of turn. A normal wedding would have at least 1400 guests and take many days due to the rituals and ceremonies. There was also many rituals of respect, including touching the feet of your parents when you leave the house in the morning, receiving their blessing by them touching you on the head. Something as simple as using an ATM has a very Indian twist. Like the saying about buses, they are all grouped together which is for the best as most have no money in them, but at least three security guards outside each, playing cards, reading a newspaper and waving you on to the next. At the end of a hot afternoon we are taken to our hotel and greeted with a sweet cup of pungent rose water. 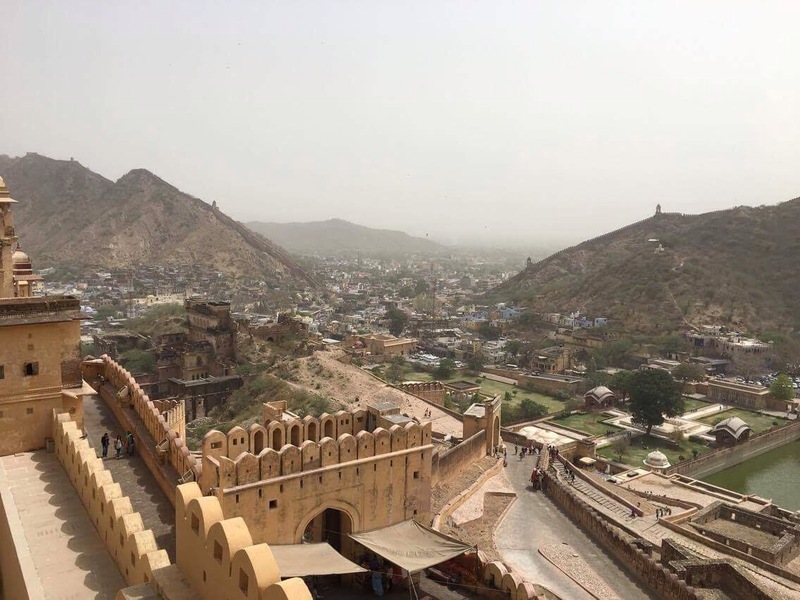 Our rooms over the old town of Amber and the Amber fort with its incredible 13km of walled fort following the tops of the hillsides to protect the old city. Every so often a watchtower, where a guide would have sat with flags and drums to warn the villagers of an attack which never came. 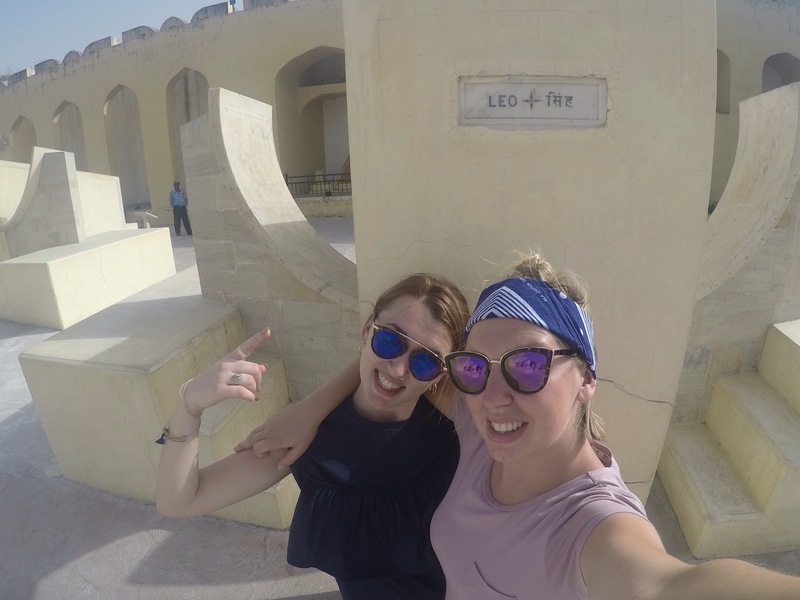 In the morning we visit the Amber fort, taken up in pairs by plodding elephant, each, a female painted with colourful decoration on the trunk and ears. As we waited in line many hawkers were selling the usual inventive nick names, however one caught our affections. He held up a t shirt made for a five year old child, in pink and was trying to flog it as a one size fits all, his attentions aimed mostly at David. With a cheeky grin he kept insisting ‘it stretchy’ and that it would flatter David greatly! It’s a 15 minute climb, zig zagging up the forts defences to the courtyard at the top through the sun gate. 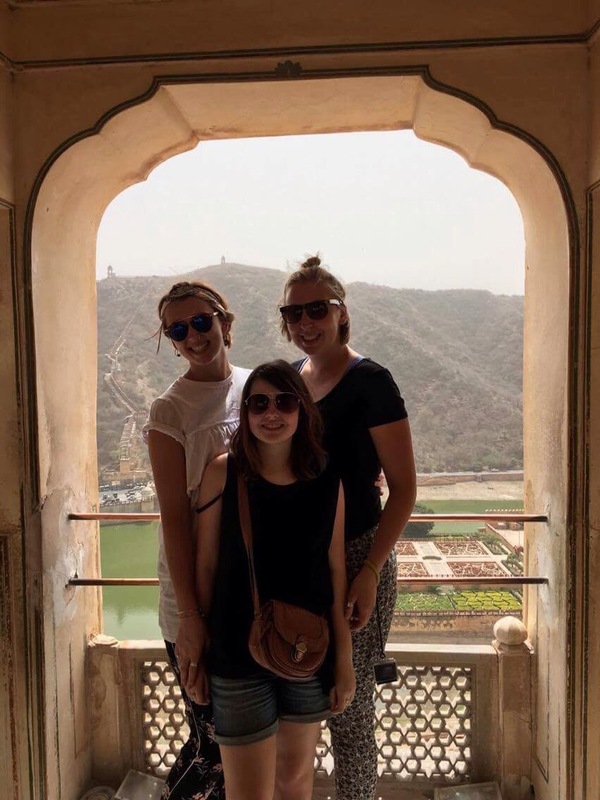 The Amber fort was started in 1592 but is a a collection of extended rooms and courtyards which expand out through the years. 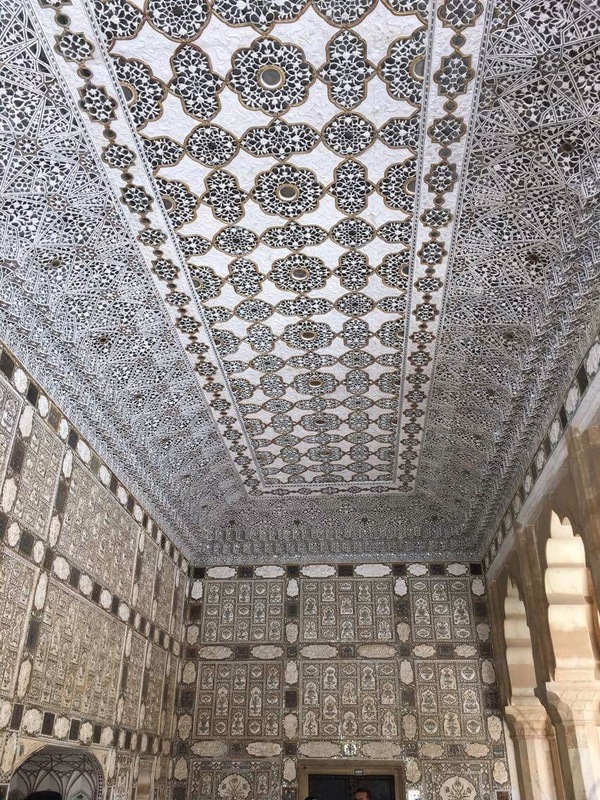 It was started by the commander of Akbars army, Man Singh and the furthest courtyard is three storeys, the top two floors his and the lower floor decided into 12 apartments for each of his 12 wives. It was fascinating to walk in between the interlinked apartments, each personalised for the wife, with a meeting courtyard in the middle should he choose to socialise or party together. Although most of his marriages were diplomatic, two reputably married his sword as he wasn’t free for the ceremony, he conceived many children, his first son going on to extend to the next courtyard and so on. Each courtyard had amazing views over the old city of Amber which is nestled in the valley of two hills, protected by the fort walls. An amazing part was the mirrored room in the hall of victory where thousands of mirrors were mosaicked into the walls, twinkling with grandeur. 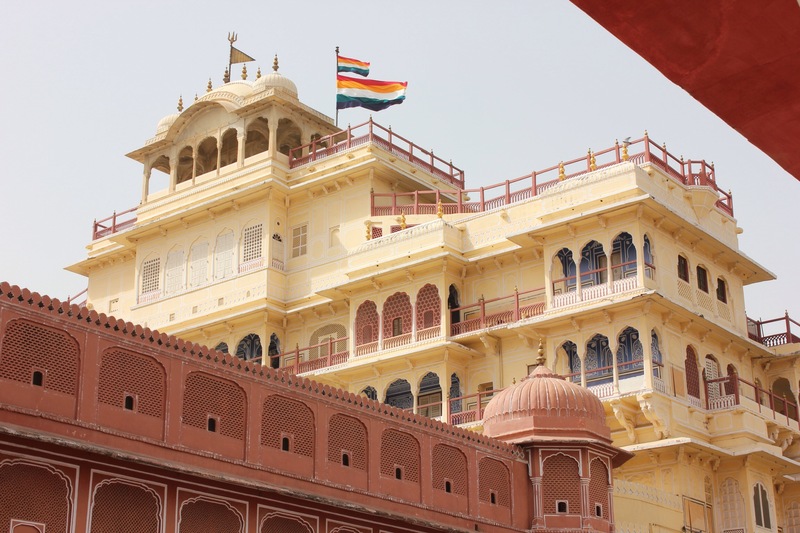 The city of Jaipur is stunningly beautiful, maintained and obviously well planned. 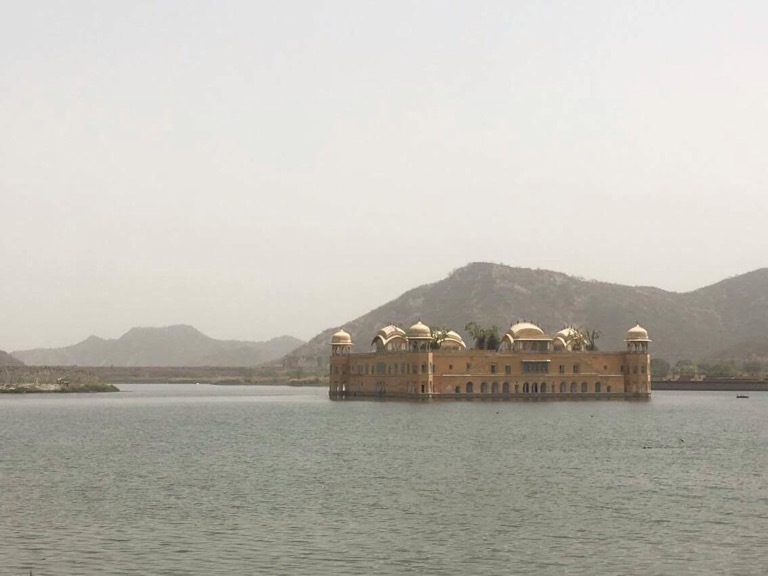 On the lake sits a beautiful water palace, once home of dancing and music. 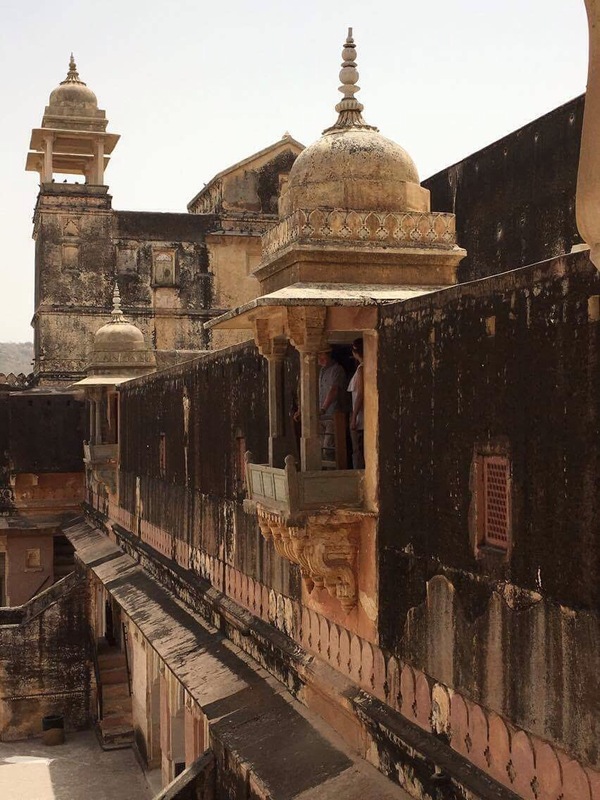 Apart from this, inside the main city, the straight walls are lined with different bazaars, selling everything from perfumes to spices, flowers to handiware, silks to wedding bands, samosas to clocks. We kept our guide busy identifying strange toot that we hadn’t seen before, taking in the hustle and smells of the area. Crossing the road has become more natural, particularly in a group. Nothing stops, but then nothing is fast and as you meander out into the middle of the road, the traffic mearly avoids you like any obstacle, tooting to acknowledge your presence. As one guide said, Hindus do not believe in death, only rebirth, so they are never in a rush. Whatever there is no time for in this life, there will be time in the next. Slow down, relax, you are in India now and things will happen in their own time. We were taken to some factories to see the craftsmanship of the goods produced here. Famous as a gem city we were first taken to see the work of those crafting the many birthstones. Emerald and Ruby are the main stones of the area, although they work with diamonds as well as many other precious and semi precious stones. Some of the jewellery was beautiful, although much is gaudy and brash, fitting in perfectly with the many colours and accessories of India. Secondly we went to a print workshop where we got to try out some of the block printing, done by hand using many stamps, and several colours where a few would do. It was interesting to see and we were entertained by the multiple sales pitches of the families running the shops. On our way out of the city the next morning, we stopped at the Wind Palace. A beautiful wall of many windows, it acts as a facade to the corridor running over a km from the palace, so women could watch the parade without being seen. 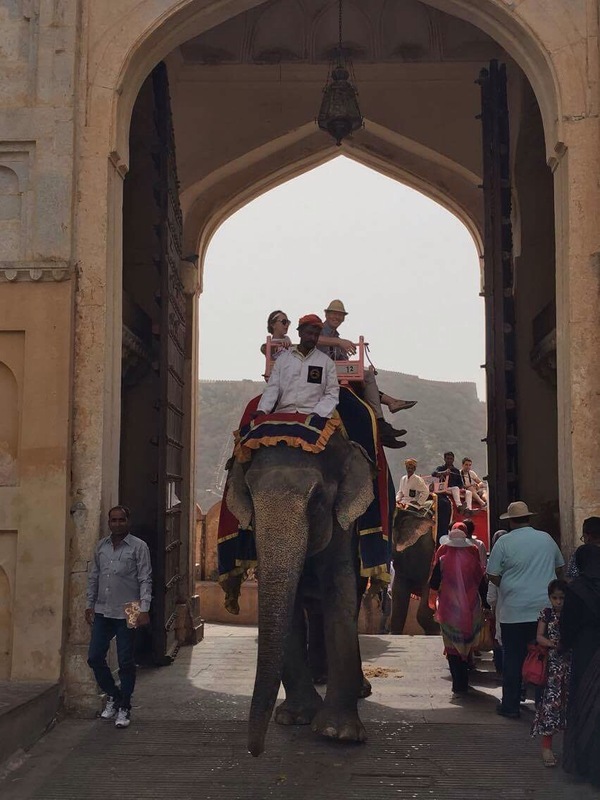 Jumping out to photograph the spectacular structure, we were immediately jumped upon by beggars, sellers and snake charmers all adding to the adventure of roadside menagerie. 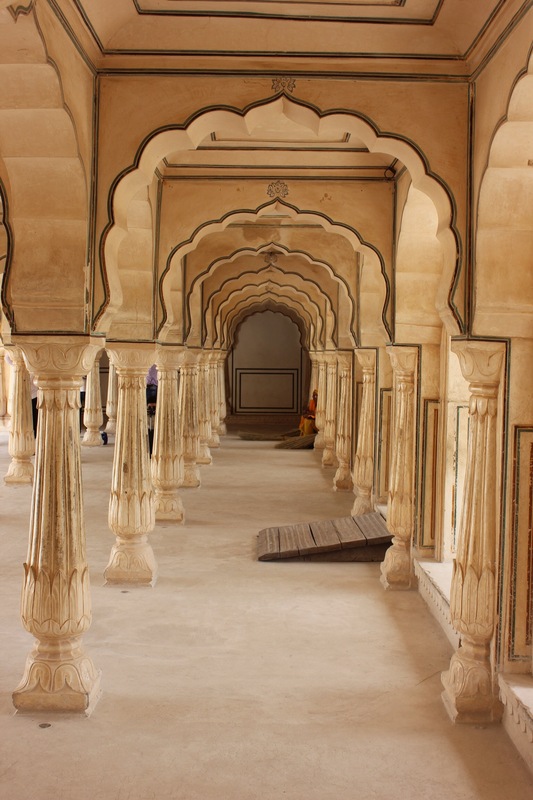 And with that we made out of the pretty city for Northern Rajasthan.